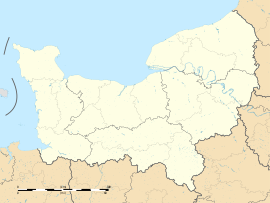 Bertreville-Saint-Ouen is a commune in the Seine-Maritime department in the Normandy region in northern France. A farming village in the Pays de Caux, situated some 10 miles (16 km) south of Dieppe, at the junction of the N27, D23 and the D306 roads. The church of St.Michel, dating from the thirteenth century. The church of St.Ouen, dating from the nineteenth century. Wikimedia Commons has media related to Bertreville-Saint-Ouen. This page was last edited on 24 July 2017, at 13:56 (UTC).